A vintage Sarouk rug and antique framed art pieces provide an interesting visual contrast to the contemporary and organic feel of the lead sculpture and handblown glass chandelier. The drama of the light fixture creates a solid central focal point in a space once dominated by an abundance of doors and windows. 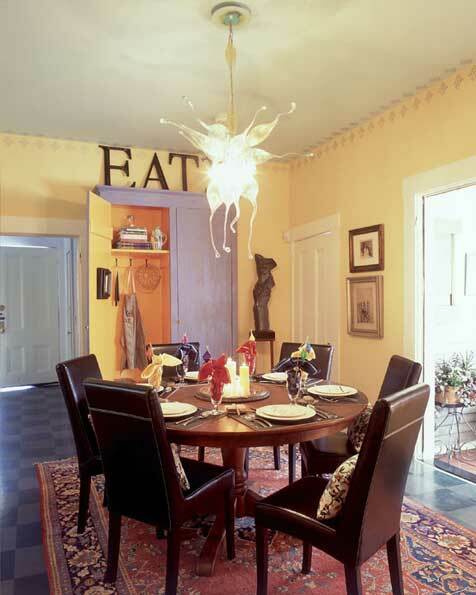 A round table promotes inclusive mealtime conversation in this breakfast room in Newport, Rhode Island.